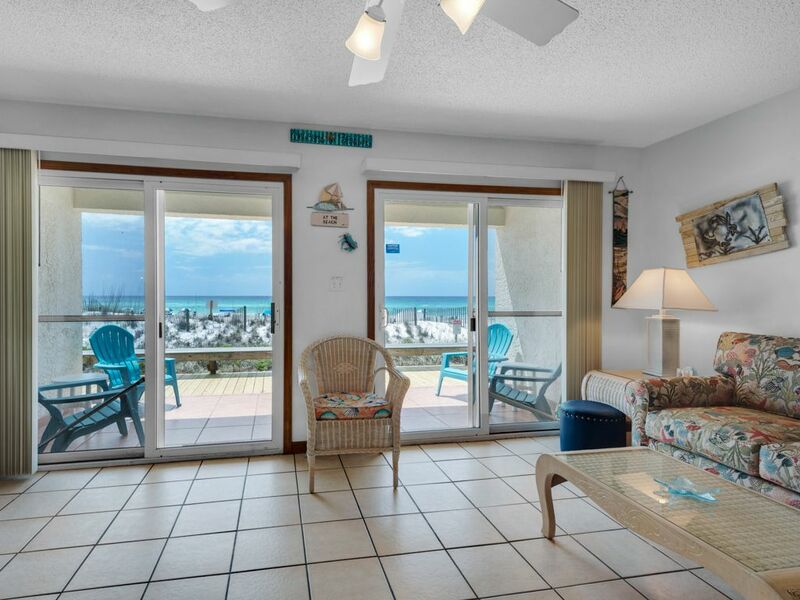 Eastern Shores 202 is professionally managed by ResortQuest by Wyndham Vacation Rentals. You will be in awe as you enter this beautiful condo and fall in love with the hand painted beach mural that runs the entire length of the hallway. Step off your patio and right onto the boardwalk. This unit exudes a feeling of a warm summer beach day. The eclectic colors form a perfect symbiosis with a traditional beach home making a memorable vacation destination. A fully equipped kitchen has all the essentials you will need to prepare your family's favorite dinner. The dining room table seats four with additional seating for three at the wooden kitchen countertop. The living area has plenty of room to comfortably accommodate six people. The master bedroom features a king bed and the room furnishings are island themed and sure to bring splendid dreams to its tenants. This unit contains one and a half baths. We can’t forget the very handy bunk area. These are perfect for children and teenagers. This property does not have an elevator. Great place on the beach! Had a beautiful view! Would stay here again! Thank you for your review, we appreciate your comments. The Eastern Shores is located on a great beach that is not crowded. We look forward to your next beach vacation with ResortQuest at Eastern Shores. Great location, right on the beach with wonderful views. It had everything we needed. Quiet location. Only one parking spot per unit. The sliding doors were hard to slide and, when you bring your own chairs and umbrella the beach service company takes up much of the beach. The water was crystal clean and calm. We would definitely consider this place if we come with a small group. We are so happy to hear you enjoyed your stay at Eastern Shores! Your guest experience is our top priority. Thank you for taking the time to write a review about your vacation after you returned home. We hope you are able to visit again soon. We loved this area. Can’t wait to booked our next stay here.